This is a guest contribution from Sharfuddin Ripon. First three fall into circular knit slots. Fully Cut like Cut & sewn in woven, tubes here cut open lengthwise to cut into parts as patterned to sew together. In stitch shape, tubes are cut width-wise depending upon the body length of each garment (with provision for 1 / 11/2” sewing allowances) called blank. Here cutting and sewing jobs are less than what required in fully cut since the tubes remained seamless. Integrals are fully machine knitted requiring no cutting or seaming. Socks, pantyhose, hand gloves (fingered), caps are garments or accessories falling in this group. Amongst the knits fully fashion garments are knitted in V- bed flat knitting machine, driven either by hand or machine (auto). Panels or parts of a garment (front & back body panels, sleeves, necks or collars) are knitted individually as per specification and styling properties of the garment. 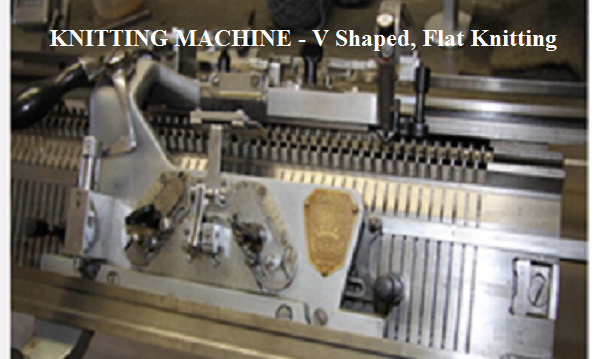 Since panels are coming out of the machine with required shapes, curves and measurements no cutting is required. Instead of sewing parts are linked together in linking machines with self-yarn (the yarn used for knitting body parts) to complete a garment. Regular yarns like cotton, acrylic, polyester, or wool may be required for linking in case the garment is made of fancy yarns lacking required thickness and tensile strength. Sweaters are the only garment in the fully fashion category knitted in a flat knitting machine. The machine used for knitting fabrics or body parts called V (upended) Bed Flat knitting machine and can be either hand or machine driven. Both front and back beds have needles. Flat knitting is the act of synchronizing between Needle, Course, and Tension depending upon the gauge (GG) of machine or fabrics. Gauge or GG denotes the numbers of needles in one linear inch across the breadth of the machine. If the machine houses five needles/inch, then this going to be a 5G Kitting machine. The number of needles per inch in the machine bed is the number of gauge of the machine. Popular machine gauges are here in flat knitting starting from 1.5 to 14GG. 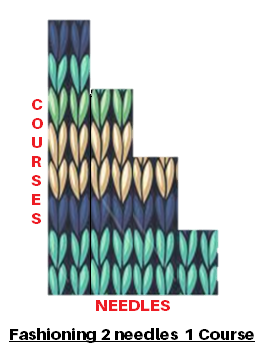 Well, the numbers of needles vary with the machine breadth and GGs. Without physically counting the needles in a machine one can be certain about the same by adopting the formula Breadth of M/C X No of GG X 2 – 1 Needle. Say it’s a 32-inch breadth 7 Gg M/C and the numbers of needles available for use are (32 X 7 X 2 – 1) 447. You need to deduct 1 needle because the back bed houses 1 needle less than the front. 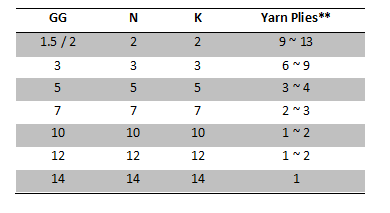 Unlike woven fabrics knitting is done with a single strand of yarn, hence fabrication is done by forming Loops called Courses denoted by K in knitting chart. 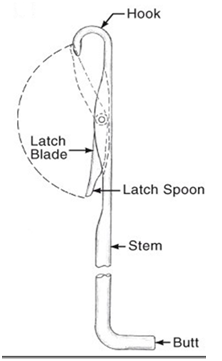 Needles to achieve the width of fabric or chest of the garment, while Courses to the length of the fabric or garment. 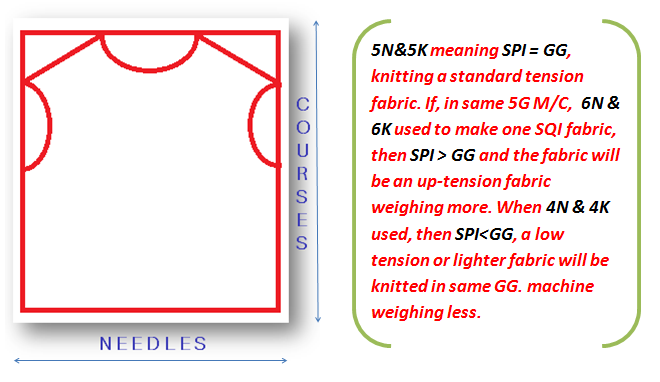 In Standard Tension SPI = GG (SPI, Stitch per Inch). These beings so, if in 1 square inch fabric there are 7 needles and 7 courses then it’s a 7G fabric made in 7G M/C. To knit a panel measuring 30X30” in 7G machine, as an example, a total of 210 needles and 210 courses will be required. SPI will not agree to GG if tension deviates from the standard, thus require more or fewer needles and courses in the same machine. Since needles to chest or width and courses to length, correcting deviations in chest measurement needles are required to be adjusted (activation & deactivation), while courses are required to be adjusted to correct the measurement of body length. All these adjustments are to be made keeping in mind the required weight of the garment. Technically weight of the garment depends on the loads of Ns & Ks. A customer might not agree to lift the order if underweight by more than ½ lbs. /dozen garments. And overweight will result in short in production. When adjustments of needles and/or courses could not work, adjustments in tension can be made as a last resort to correct the fabric and the measurements as well. The shapes, curves or designs of the sweaters are achieved by a term called Fashioning. Thus, sweaters are named fully fashion garment. This is the distinguishing feature of flat knit sweaters standing it out from the rest of knits. The very fashioning is done by a process termed Widening & Narrowing. Needles are activated or de-activated with courses to shape the garments. To widen (say, bottom ribbing to the body) needles are activated with courses depending upon the rise of the widening and reverse is effected while narrowing (Say, Armhole curve) a body part. The activation or increasing of needles is done by pushing the needle in the groove up, while de-activation or decreasing is done by pushing the needle down. The perfection of shapes and curves depend on how masterly designer tune the needles and courses in drawing knitting chart. 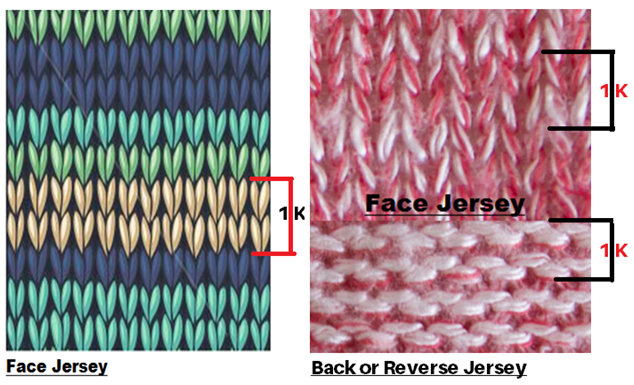 Calculation of direct knitting wages or costs depends upon types of machines. Where hand driven knitting machines are used, wages fixed upon the basis of pieces knitted by a knitter in a shift. For machine driven auto knitting machines it is based upon minutes required to knit a piece of garment. Sharfuddin Ripon has served Bangladesh RMG industry for 20 years in various corporate positions. Associated with BGMEA Institute of Fashion & Technology, BIFT, Chittagong as guest faculty of Apparel Merchandising. He has published many articles on his blog Quality Fashion Lines. 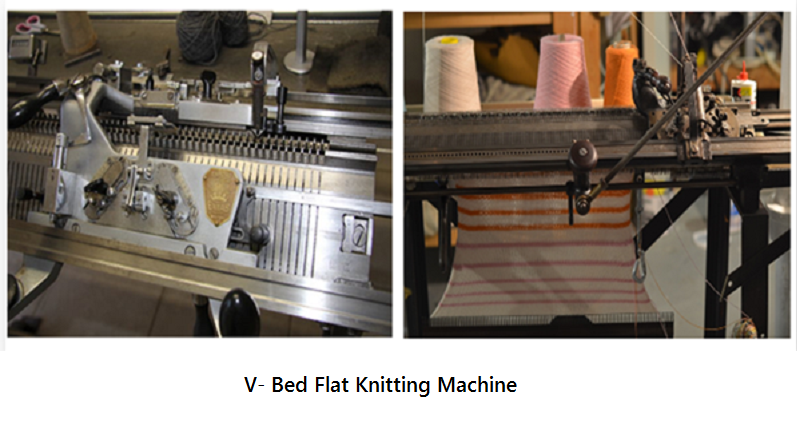 Flat knitting machine, Construction of knitted fabric.